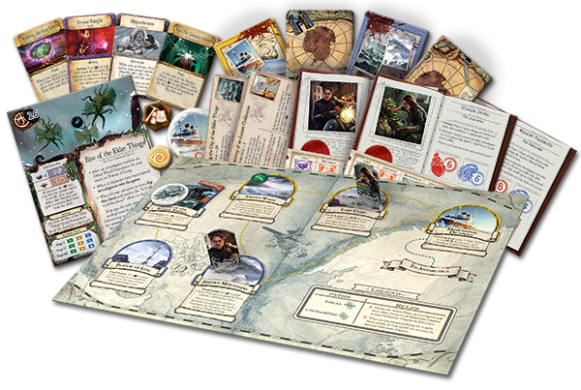 Mountains of Madness is the second expansion for Eldritch Horror , a cooperative game of terror and global adventure for one to eight players. Inspired by H. P. Lovecraft’s novella about an ill-fated Antarctic expedition, Mountains of Madness opens the desolate and eerie expanses of Antarctica, where lie the ruins of the Elder Things’ primeval civilization. Hidden there are the clues and artifacts you need to prevent the Ancient Ones from rising, but the ice also conceals inhuman, terrifying creatures, recently awakened and thirsty for blood. You will find in Mountains of Madness a side board depicting six different Antarctic locations. Two new Ancient Ones threaten humanity in unprecedented ways, and eight investigators join the international effort against them. Additional gates spawn monsters in previously safe locations and a plethora of Assets, Artifacts, Conditions, Spells, and the Focus Action become available for use in the struggle against impending doom. The side board featured in Mountains of Madness allows you to follow the route of Professor Lake’s doomed Antarctic expedition from the bustling Miskatonic University outpost and the remnants of Professor Lake’s ravaged camp to the megalithic City of the Elder Things and the mythical, otherworldly Plateau of Leng. Since Antarctica is so very different from any other place on earth, Outpost and Mountain cards, as well as Antarctic Research cards, give investigators adventures unique to that continent. Those encounters are often shaped by Antarctica’s treacherous climate, which can prove just as deadly as any monster. You may find yourself stumbling through snowdrifts, struggling against hunger and hypothermia, or fighting to subdue companions maddened by the isolation and the cold. Even if your efforts against the Ancient Ones do not lead you into Antarctica, you may nevertheless discover the Heart of Winter , meet a survivor from the Miskatonic expedition , or be attacked by a monster creeping north from the thawing Antarctic ice. Lurking in the Antarctic ice are the Elder Things, one of the Ancient Ones introduced in Mountains of Madness: creatures that ruled the earth long before humans were a sapient species. Frozen and dormant, their tall, star-shaped bodies seem monstrous but not harmful, strange and exotic like coral. When they awaken, however, the Elder Things kill every living thing around them without pausing to think. Not only are they capable of quick and cold-blooded slaughter, they are tremendously intelligent creators of technologies beyond human conception. Were they to rise again, these Elder Things would destroy – or worse, enslave – mankind. Can you destroy these brilliant and ruthless monsters before they become too powerful to overcome? Mountains of Madness includes eight investigator sheets, increasing the number of roles that players can take on. Hailing from places as distant as Australia, India, and the Heart of Africa, these investigators bring a panoply of skills to the battle against the Ancient Ones. One, having retired from his legal career, now seeks justice for his murdered wife. Another waited tables at a diner in Arkham until memories of a past life suddenly flooded her mind. One investigator has spent her life learning ancient languages and exploring ruins of prehistoric empires, another has just joined the police force and now finds himself protecting Alaskan settlers against monsters from another world. 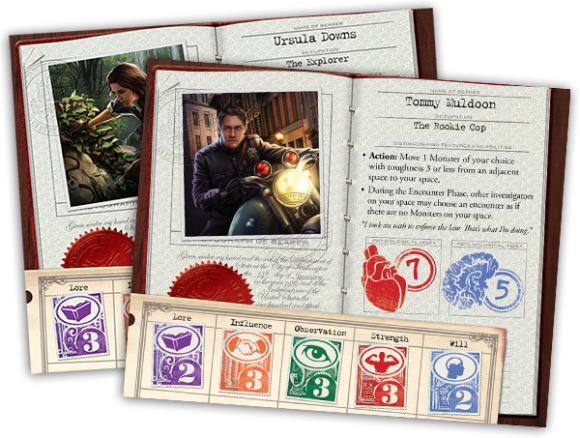 Whether you prefer to pour over tomes of mythology in London’s museums, secure funding for the Antarctic expedition in San Francisco, or seek Other World Encounters across the globe, there is among these investigators an absorbing and vivid role for you to play in Eldritch Horror. Exploring Antarctica requires provisions, guides, sled dogs, and other Assets that you would not need if traveling more populated regions, but, should you venture to Antarctica, you will find priceless and powerful Artifacts to protect you against both the Ancient Ones and the brutal cold in those far reaches of the world. Two types of Assets are introduced in Mountains of Madness: Task Assets and Unique Assets. Task Assets are only different from other Assets in that they can be used only once and are activated as a result of an investigator’s activities, rather than within an encounter. Unique Assets form their own deck and some, similar to Conditions and Spells, contain effects on the back that must be resolved when the Unique Asset is used. However, unlike Conditions and Spells, the effects on the back of a Unique Asset are reliably positive: you may gain another clue, or find a sudden Ally. 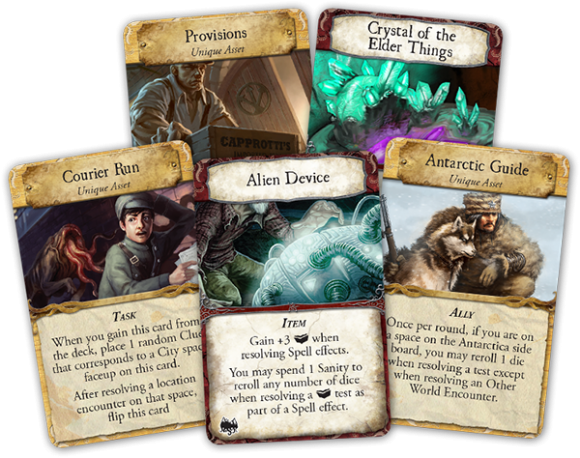 If you anticipate a particularly challenging encounter, Mountains of Madness allows players to use an Action to gain a Focus token, which you can spend during a test to reroll a die instead of spending a Clue. A Focus token could prove to be the difference between improving a skill and gaining a horrible condition, or between defeating a monster and losing your sanity. While offering players the chance to make Antarctica a critical battleground in humanity’s war for survival, Mountains of Madness brings hideous horrors to every continent and raises the stakes of every investigation. No matter the shape or location of your struggle against the Ancient Ones, Mountains of Madness takes the adventure of Eldritch Horror to another level. [b]Prelude Cards[/b]: These are a nice little addition to the game. One Prelude card is introduced at the start of the game, and adds a little something extra (a Mythos card already in play at the start of the game, some extra adventures to pursue, etc.) Basically, the Preludes add an extra touch of variability, more replay value to the game, and additional story. [b]Ancient Ones[/b]: There are two, both very well done. Ithaqua adds to the existing roster of classic Mythos beings that you can face, and with the constant threat of the new Hypothermia condition the game has a definite thematic element when facing the Thing That Walks on the Wind. The other is Rise of the Elder Things, which is extremely fitting to the overall theme of the expansion. The Elder Things also presents and interesting variant that I hope to see explored even more in future expansions: the “Ancient One” isn’t so much as Ancient One (i.e. Outer God/Great Old One) but rather an event. [b]Antarctica board[/b]: This was done very well. The expansion board only comes into play as a result of one of the Prelude Cards that are introduced in this game or by facing the Rise of the Elder Things as the Ancient One. The board itself is similar in style to the main board, with a half dozen new locations each with their own special encounters, etc. What I especially like about the board is that it bodes well for future expansions and the question of table space, etc. (which was another issue with Arkham Horror–much as I love it, it’s a table hog with all the boards in play). The expansion board fits neatly to one side of the main board, and is exactly half the height of the main board. That means that if FFG sticks to the system where you only use a particular expansion board if a specific Prelude and/or Ancient One is in play, a single game of Eldritch Horror will never utilize more than 2 expansion boards at any one time, and two boards is exactly what will fit neatly next to the main board. This will be good in the long run, as I suspect if “Mountains of Madness” is anything to go by, over time we may see expansion boards for each of the Expedition Locations. The only minor downside is there are half a dozen new clue counters and three gates which only get used if the Antarctica board is in play. These need to be removed from their stacks otherwise, but if you keep your counters organized when the game is packed up, it’s pretty easy to quickly add/remove these depending on the game. All in all, I really liked this expansion, and I’m excited to see Eldritch Horror continue to grow. The only thing still missing for me is Harvey Walters. Harvey’s been a part of every Call of Cthulhu RPG and card/board/dice game I’ve owned since the 80s and it feels odd that he’s still absent from EH! 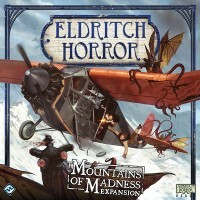 Add a Review for "Eldritch Horror: Mountains of Madness"